The following account of the life of Saint Brendan first appeared as a series published in the Irish Ecclesiastical Record in 1872. There are four instalments in total and they reflect very well the sense of rediscovery of the Irish saints in the cultural revival of the nineteenth century. The scope encompasses much more than just the life of Saint Brendan for we meet a variety of other holy men and women, and the monastic rule attributed to Saint Ailbe is given in full in part III. I haven't attempted to reproduce the footnotes and have also omitted some material from part IV, but the original volume is available here. I. St. Patrick's Blessing on Munster. Eulogy of St. Brendan. His Father. Birthplace. The Birth of St. Brendan foretold by St. Patrick and St. Bec-Mac-De. First gifts to St. Brendan. He is baptized by St. Erc. The year of St. Brendan's Birth. Meaning of his Name. The Baptismal gift. St. Brendan given in fosterage to St. Ita. The virtues of this great Patroness of Munster. Poem composed by her. St. Brendan for Five years under her care. On its mountains, on its peaks, a blessing." "Brendan was the chief of the faith and piety of the west of the world in his own time. He was like to Abraham in righteousness; a high prophetic psalm-singer, like David son of Jesse; an illustrious sage, like Solomon, son of David; a lawgiver, like Moses, son of Amra; a gifted translator, like Jerome; full of wisdom, like Augustine; a chief lecturer, like Origen; a virgin, like John of the bosom, the foster child of the Lord; a gospeller, like Matthew; a teacher, like Paul the high Apostle; the head of forgiveness, like Peter the Apostle; a hermit, like John the Baptist; a commentator, like Gregory of Rome; a prudent messenger of sea and land, like Noah, son of Lamech; and as Noah raised his ark over the swelling waters of the Deluge, so will the son of Findloga raise up his disciples and his people above the wrath of judgment, so that, through the power and pure piety of Brendan, no fire or smoke, or fog, or sparks, shall reach them." Of the race of Ciar, son of Fergus." O'Clery, in his "Genealogies of the Saints of Ireland," gives in detail the parentage of our Saint, as follows :"Bishop Brendan, son of Fionnlugh, son of Olcon, son of Alta, son of Fogomain, son of Fithcuire, son of Delmna, son of Enna, son of Usralaig, son of Astamain, son of Ciar, son of Feargus, son of Rosa, son of Rudraighe." Findlugh, the father of St. Brendan, is described to us as a virtuous and just man, who, living in peace and lawful wedlock, served God faithfully, with his wife, under the rule and guidance of Bishop Erc, and merited to have three other saints among his children, viz., St. Domaingen, Bishop of Tuaim-muscraighe, St. Faithleach of Cluain-tuaiscert, and St. Faolan, of Cill-tulach. Some writers have supposed that St. Brendan was a native of Connaught; this opinion, however, is quite at variance with the ancient records of his life, and probably had its origin in the fact, that the great monastery of Clonfert was founded by him, and that he spent thErc the closing days of his saintly career. The Latin narrative expressly states that he was born " in the western district of Munster, called Ciarraighe," i.e., Kerry ; and the Irish life still more clearly defines the locality, telling us that " the precise place of his birth was Alltraighe Caille, situated in Ciarraighe Luachra." That portion of Kerry which extends from the slopes of Sliebh-Lougher to the sea, was anciently known as Ciarraighe-Luachra, whilst Alltraighe-Caille was the name of the lesser district, now comprised between Ardfert, Fenit, and Tralee. Thus, the ancient records allow no room for doubt as to the birthplace of our Saint ; and, I may add, that popular tradition fully corroborates this testimony of authentic history. The fertile and wooded plains of this western district, washed by the waves of the broad Atlantic, are rarely mentioned in the romantic tales of our pre-christian period : henceforward, however, they shall have a leading part in the joys and sorrows of Ireland, and be the theatre of some of the most remarkable events of her chequered history. During her ages of faith, they shall be enriched with the blessings of heaven, and witness many holy and happy scenes. In the succeeding era of foreign plunder and domestic dissensions, no territory shall be more sadly pillaged. In the three hundred years of our nation's martyrdom for Christ, no district shall give more martyrs to religion, or see its sons more joyfully go forth to shed their blood for the faith. The age in which we live is, for Ireland, a time of reconstruction ; everywhere we see the faithful busy restoring the sanctuary, and rebuilding the ark of God : and, once again, this district seems destined in the ways of Providence to take a leading part in the work of faith. The Vexilla Regis solemnly entoned in Tralee, whilst these lines are written, gives proof that the Cross of Christ is triumphant there: the old abbey re-consecrated to-day will once more gather together within its hallowed walls many children of Christ; and this festival of Holy Cross marks, we fondly hope, the re-opening of a cycle of holiness and happiness to shed its choicest blessings on this favored region. But, to return to St. Brendan : his birth was the theme of prophecy. When our glorious Apostle St. Patrick visited the territory of Luachra, about the year 450, he foretold that "thirty years thence there should be born in that district of West Munster, a great Patriarch of Monks, the star of the West, St. Brendan, of the Hy-Alta family." St. Bec-Mac-De, who is commemorated in the Martyrology of Donegal as "a celebrated prophet," and in the Irish Life of St. Brendan is styled "the chief Prophet of Erin," though as yet a young man, also prophesied the birth and future greatness of our Saint. and afterwards the Brugaid took the child in his arms and said : "This child shall be my foster-child for evermore." The mother of St. Brendan, a little while before his birth, had a vision, in which it seemed to her that her own bosom was radiant with heavenly light, whilst her lap was filled with a quantity of the purest gold. Having mentioned this vision to the holy Bishop Erc, he said to her : "You shall bring forth a son, wonderful in his holy deeds, and full of the grace of the spirit of God." St. Erc himself, on the night of St. Brendan's birth, was favored with another vision from God. I shall narrate it in the words of the Irish writer of St. Brendan's Life : "On the night of Brendan's birth, Bishop Erc saw the whole country around in a blaze, such as never had been witnessed before ; and the angels, arrayed in robes of white, descended in various ministrations upon that district. Early next morning, St. Erc arose and came to the house of Findlugh ; and taking the child in his arms, he said : ' O servant of God, take me unto thee as a faithful disciple, for, though numbers are joyful at thy birth, far greater is the joy which inundates my heart and soul.' After this, St. Erc prostrated himself before the child, and shedding tears in abundance in token of his joy, administered Baptism to him." In the battle of Cell-Osnadha, the foul." He was a refuge to the men of Erin." In body and in soul." The other is recorded by Lynch in his MS. History of the Irish Sees: "The name Brendan was given to him, i.e., Braenfhionn, because on the day of his birth dew of heavenly whiteness descended on the whole country around the spot where he was born." They came forth from the well together." St. Brendan was allowed to remain with his parents only during the first year of his childhood, after which time he was consigned by St. Erc to the care and fosterage of St. Ita, "the Brigid of Munster." and the gloss adds that "she was of the Desii, and a disciple of Benedict," one of the first companions of Palladius, and, subsequently, fellow-labourer of St. Patrick in the work of the Gospel, whose memory was long cherished at Inisbeg, in the diocese of Ferns. As regards her penitential life, the Felire commemorates that " there was a chafer constantly gnawing her, till, at length, it became as large as a young lap-dog, and it eat away her whole side ; yet no one perceived her suffering. On one occasion the chafer came forth from its den, and Ita, happening to leave the spot, some of the nuns saw the worm, and killed it. Ita, soon returning, asked: 'Where has my pet gone to ?' The nuns replied : ' Shut not heaven against us ; we saw the worm, and knowing not that it was not hurtful, we killed it.' Ita then foretold, that in punishment no nun should be her comharb in that monastery, and she prayed God to send his divine Son to comfort her." All is deceit but little Jesus. That I press to my heart each night. To pray him not, we shall be sorry. Jesus the son of the Hebrew maiden. More hopeful for me is my little Jesus. Through love of the Lord." "Ite, Virgin, of Cluain-Creadhail. Mide was another name for her. She suffered great martyrdom for God: a worm was gnawing her, unknown to all for a long time, until it was as large as a sucking-pig, so that it withered all her side .... A.D. 569 was the year of her repose. Deirdre was her first name. She was of the race of Fiacha Suighdhe, son of Feidhlimidh Reachtmhar, son of Tuathal Teachtmhar. Neacht was her mother's name." They fondled the child with joyous love." II. St. Brendan at the School of St. Erc. Many Saints of the name of Erc. St. Erc, of Slane, the tutor of Brendan. Sketch of his life. St. Brigid and the Disciple of St. Erc. St. Brendan and the wild deer of Sliabh Luachra. His affection for his sister. Angelic visions. Penance imposed on St. Brendan. Miracle performed by him. St. Brendan studies the Rules of the Saints of Erin. Words of St. Ita. St. Brendan and St. Jarlathe of Tuam. Poem composed by them. From the fostering care of St. Ita, Brendan passed to the school of St. Erc. He was not, however, at once admitted among the disciples of that holy bishop their duties were too arduous for his tender years; but he at once entered on a course of preparation for that higher state of perfection, and for five years ' read the Psalms with fervour,' being at the same time diligently trained to walk in the paths of piety and learning. It was thus that, in the early ages of Christianity, the duty of training up youthful aspirants to the sanctuary devolved on the bishops themselves. St. Augustine, in Hippo, instructed his own clergy, and so, too, did St. Ambrose in Milan, and many similar instances are registered in the lives of the sainted bishops of our island. The life of St. Brendan affords us no clue for determining which of the holy bishops who bore the name of Erc was thus privileged to train the youthful mind of our Saint. "The Martyrology of Donegal" has four entries referring to saints of the name of Erc. Thus, at 17th September, it commemorates "Erc, bishop of Domhnach-mor Maighe-Damhairne :" again, at October 2nd, it has the simple entry, " Erc bishop :" at October 27, "Erc, bishop of Domhnachmor Maighe-Luadhat, in the north of Ui-Faelain. This may be Erc, bishop, son of Fergna, son of Folachta, who is of the race of Bresal Breac, from whom the O'Sraighi are descended :" in fine, at November 2nd, " Erc of Slane, bishop of Lilcach and of Fertaferfeig, at the side of Sidh-Truim, to the west. The age of Christ, when he went to heaven, was 512." The Martyrology of Tallaght also commemorates each of these festivals, with the sole difference, that at the 17th of September, instead of Erc, bishop of Domhnachmor Maighe-Damhairne" it reads, "Erc, bishop, from Domhnach-mor Maighe-Coba." Upon Bishop Erc of Slane." Colgan, more than once, refers to this last-named St. Erc, of Slane, as the tutor of St. Brendan, and Lanigan has adopted the same opinion. This is further confirmed by the fact, that St. Erc of Slane was united by close family ties with the south-western districts of our island. St Erc of Slane, "the sweet-spoken Judge," as he is styled by our annalists, was one of the royal household of Leoghaire, and was present when that monarch summoned our apostle St. Patrick to give an account of his mysterious preaching. It was on this occasion enjoined on all the courtiers to show no sign of respect to the stranger. Erc alone disobeyed the order. He arose from his seat when St. Patrick entered, and, reverently saluting him, received his benediction in return. The blessings of Faith accompanied the benediction of our apostle, and St. Erc was soon reckoned among the most illustrious of his disciples. The monastery of Slane was, in after years, founded by St. Erc, and under his wise rule became famed throughout our island as an abode of sanctity and learning. His labours, however, were not confined to that district. Thus, we meet with him at the Synod of Magh-Femyn, in Tipperary, where he recounted the praises of St. Brigid, and the miraculous powers with which she was enriched by the Almighty. His name is also mentioned among those who assisted at the consecration of St. Conleth of Kildare. Towards the close of his life he erected a small hermitage on the banks of the Boyne, where, in the deepest solitude, he, by prayer and penitential deeds, prepared himself for eternity. This hermitage of St. Erc is still, to be seen on the northern bank of the Boyne, and a more romantic or enchanting spot can scarcely be imagined. "The old walls, clothed in ivy, are situated at the foot of a swell of ground which gradually rises until it reaches the hill of Slane, and are almost washed by the blue waters of the Boyne, which sweep by the southern basement. A rich grassy plain stretches along the south of the river, and the horizon is bounded on the one side by the castle of Slane, on the other by the gray walls of Fennor church, and by the green hills and woods which rise in the distance. Near the hermitage is a large sculptured stone, having figures of the crucifixion and the twelve apostles. It is difficult to conjecture now what may have been its peculiar use, but it is held in great respect ; for, pilgrims after performing their stations at our Lady's Well, which is near, usually repeat the Pater Noster, Ave Maria, and Credo, twelve times around the stone." The monumental stone, here referred to, probably marks the spot where St. Erc's remains were at first deposited. They were, after a little while, translated to Slane, and Probus, in his " Life of St. Patrick," writes that in his day they were held there in the greatest veneration: "Hercus, filius Dago, cujus reliquiae nunc venerantur in civitate quae vocatur Slane." Shall have the blessing of Bishop Erc." The Martyrology of Donegal, at 2nd of November, styles St. Erc " the Brehon of St. Patrick": the curious tract of St.Oengus, "On the Saints of Similar Life," published in the IRISH ECCLESIASTICAL RECORD for last June, page 405, states : "In his habits and life St. Erc of Slane was like unto St. Martin of Tours." The connection already referred to of St. Erc of Slane with the great patroness of Ireland, St. Brigid, serves to identify him with the Bishop Erc who is mentioned in the following passage of the Irish Life of St. Brigid; and, perhaps, we may be permitted to conjecture that the disciple of St. Erc introduced there was one of the companions of the youthful St. Brendan: "A certain time Brigid and Bishop Erc were in Leinster: Brigid said to Bishop Erc, 'a war has broken out among your people, and they are at this moment engaged in deadly strife.' A clerical student, disciple of Bishop Erc, said :' this cannot be true.' But Brigid blessed the eyes of the student, and he then exclaimed: 'behold, my brothers are even now being slain :' and he did great penance for his incredulity." Only a few facts have been handed down to us connected with the life of St. Brendan whilst in the school of the holy bishop, St. Erc. We will mention them as they are narrated in the ancient records of his life. On one occasion, whilst the tutor and his disciple were at the foot of Sliabh Luachra,Brendan asked for a little milk, but the holy bishop " had no milch cow, for he always refused to accept any gifts, except some trifling offerings from religious people." He could not, therefore, satisfy the desire of Brendan. He said, however : "God is able to give milk to thee, my child," and as he spoke a wild deer, with her fawn, coming down from the mountain, stopped to be milked for Brendan : "thenceforward, each day, the wild deer hastened to that spot, and when milked, again returned to the mountain." 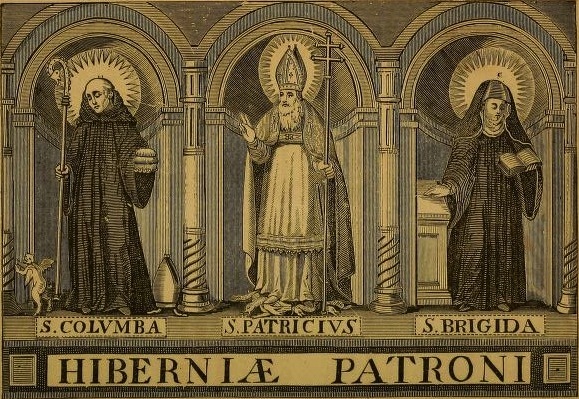 Among those who were companions of Brendan under the care of St. Erc, is especially mentioned his own sister, St. Briga, who, like her brother, soon attained great eminence in sanctity, and we will hereafter meet with her presiding over the great monastery of nuns at Enachduin. The ancient writer adds, that "great was the affection of Brendan for St. Briga ; for he saw, in a vision, the angels ministering unto her ; and whilst the face of his tutor seemed bright as the radiance of the summer sun, her countenance shone with the mild effulgence of the moon." Some reader, imbued with rationalistic ideas, may smile, perhaps, at the frequent mention that is made of the vision of angels accorded to our early saints. And yet there is nothing in such visions not fully conformable to true Christian philosophy. Physical science teaches us that there are waves of material light so small that the human eye is insensible to them, and that myriads of organized beings may exist imperceptible to our vision, though we are in the midst of them. Even so, angels may be present in the midst of us without our knowing it, and the air around us may be musical with the melody of heavenly voices, though our human faculties are too material to apprehend it. It was thus that the Prophet's servant could not see the angelic hosts which guarded his master until his eyes were supernaturally opened ; and we do not read that the vision vouchsafed to St. Stephen, at the time of his martyrdom, was visible to his persecutors. So, too, as St. Chrysostom writes :"each time the holy Sacrifice of the Mass is offered up, the choirs of angels chaunt their heavenly anthems and prostrate themselves in adoring love around our altars." Yes, thanks to the " Communion of Saints," mercifully granted to us by Providence, the angels are no strangers to their brethren of the Church militant ; we know that they are present to us, and when it pleases God, He can purify the earthly grossness of our faculties which hides them from our view. When Brendan had attained his tenth year he was permitted to accompany St. Erc when the holy bishop journeyed from district to district to break the bread of life to those entrusted to his care. On one occasion, whilst St. Erc was engaged in preaching, Brendan remained in his chariot chanting the psalms alone. A fair-haired child, daughter of royal parents, happened to pass by, and attracted by his chant and the sweetness of his countenance, stopped to play with him. Brendan, however, would not permit her to enter the chariot, and when she persisted in doing so, he took the whip and gave her several strokes with it. Crying, she ran to her parents, who complained to St. Erc of the conduct of his pupil. St. Erc, when reprimanding him, said :"Why didst thou thus strike this pious child, whose heart is free from every guile?" Brendan replied: "Indeed, it was not through anger that I drove her away from the chariot, but merely to free myself from being distracted whilst engaged in sacred reading." He added, however, a request that St. Erc would impose a penance on him commensurate to the fault he had committed. St. Erc enjoined on him to pass the coming night in prayer, in a neighbouring cave, which the holy bishop himself frequently chose as a place of silent retreat. Brendan joyously hastened to the cave, and till the following morning remained there absorbed in contemplation or chanting psalms and sacred hymns. St. Erc, who had imposed this penance only as a trial of obedience, himself kept vigil at the entrance of the cave, and throughout the night he saw the glory of heaven descending upon the cave, and choirs of angels repeating those psalms and canticles before the throne of God. Another time, whilst the holy bishop and his pupil were journeying on, a poor fugitive, who was pursued by a band of enemies, joined them, hoping to find protection in their company when the pursuers were at hand. The youthful Brendan told his doomed companion to fly to a rock which stood close by, and at the same time raising his hands in prayer, blessed both the rock and the fugitive. When the pursuers approached, the rock appeared to them as the man they sought, whilst the fugitive appeared to them as the rock. They at once rushed on their victim and bore away his head as a trophy of their vengeance. When they had gone away a good distance, St. Erc said to them : " O wretched men ! see how God has played with your sinfulness: you listened not to the voice of His servants, but He has blinded you in your wickedness, and it is a mere lump of stone you have carried off as a trophy of your folly." At these words the eyes of the wicked men were opened, and recognising the miracle which had been wrought, fifty of that band entered on a life of penance, and devoted themselves to the service of God under the rule of St. Erc. The "Irish Life" next tells us, that " when Brendan had read the Canons of the Old and New Testament, he was filled with a holy desire to learn the rules of the great saints of Erin : and bishop Erc, recognising the inspiration of God in this desire, permitted him to go visit the saints of Ireland and to learn their rules ; and he said to his disciple : ' When you have learned these rules of holiness, return to me again that you may receive your grade (i.e., ordination) at my hands.'" The first visit of Brendan was to his own foster-mother, St. Ita. She, too, commended his pious purpose, but added the admonition : "Be careful that your visits to the virgins of Christ be not too frequent, lest your good name be lost, and the honour of God be blasphemed by men." The only one of the great founders of religious rules mentioned in the ancient records as at this time visited by St. Brendan, is the patron of Tuam, St. Jarlathe. The " Irish Life" thus writes : " Brendan went into Connaught, for he had heard of a certain pious man who was there, named Jarlathe, son of Loga, son of Tren, son of Fiach, son of lomchadha, son of Breasal, son of Fiacha Finn and Brendan learned with him all the rules of the saints of Erin." Three hundred genuflexions each day." By those who are interred in its clay. That shall be made known to us therein." It will be a place for subduing sins. It shall be changed from Paradise to hell. They shall be subject to your will." They will shine like the sun. They will not suffer pain in the world to come. Whosoever shall be buried in its clay. "Be not vengeful, O Mac Duach! And my cuile without end. They will overcome every assailant." III. St. Brendan visits the chief Fathers of Monastic Life in Ireland. He restores a dead youth to life in Magh-Aoi. His religious Rule dictated by an Angel at Moyenna. The Rule of St. Ailbhe: its importance: where preserved: its complete text. St. Brendan is promoted to the Priesthood. BRENDAN, having taken his leave of St. Jarlathe, proceeded towards the north to visit some of the other great Fathers of a spiritual life who then adorned our Church by their learning and sanctity. As he passed through the Magh-Aoi, a vast plain lying between Roscommon and Elphin, he met an afflicted family, who, in tears and mourning, were carrying a deceased friend to the grave. Moved to compassion at their sorrow, he sought to comfort them, and said : "Place your confidence in God, for it is in His power to restore the dead youth to life;" and then St. Brendan prayed with them for a long time, till the deceased rose up, and returned home with his friends in great joy.The fame of this miracle soon spread far and wide. Brendan was conducted to the chieftain of that territory, who offered him a Ferand, i.e., a tract of land on which to erect a monastery, wheresoever he might choose to reside: but the saint replied that he would not presume to erect a religious house without the permission of his own spiritual Father St. Erc. Wherefore, bidding farewell to the chieftain and people of Elphin, he hastened back towards his own monastery. At Magh-Enna, which name still marks a spot near Turlough, in the county Mayo, an angel appeared to him, and, as we read in the " Irish Life," said to him : " Write the words of eternal life which I shall dictate to thee :" and Brendan, at the angel's dictation, wrote the whole of the Ecclesiastical Rule, which was afterwards followed in his religious houses, and led innumerable souls to heaven. It was on account of this Religious Rule that St. Brendan was reckoned among the eight great Patriarchs of the monastic life in our early Church. No fragments of this "Rule of the Angel" have been preserved to us : and yet, when the writer of the Latin Life of St. Brendan compiled his work, it was still extant: "According to that Rule," he says, "St. Brendan shaped his life, and it is still preserved by the successors of the Saint." The "Irish Life" also attests that " St. Brendan wrote from the angel the whole of the Blessed Ecclesiastical Rule, and that Rule is still extant." The only monastic Rule that has come down to us from those immediate disciples of our apostle St Patrick, who at this early period of St. Brendan's life were the Fathers and guides of religious observances in our island, is the Rule of St. Ailbhe. It is addressed to Eoghan, son of Saran, abbot of Cluain-Caolain, in the county Tipperary, and is written in the earliest Celtic dialect, so that even the great scholars who compiled the " Annals of the Four Masters" and the "Martyrology of Donegal," deemed it a difficult task to interpret it. Thus, when mentioning St. Eoghan, who is venerated on the 15th of March, the "Martyrology of Donegal" writes: "I think this is Eoghan, son of Saran, of Cluain-Caolain, for whom Ailbhe, of Emily, composed the very hard Rule, which begins: 'Say for me to the son of Saran.' "
Without assumption of pride, without vanity. And help every one that is in sickness. And heal the wounds of every soul.
" Without haughtiness, without double-dealing, . Let him shun pride and idleness. Without blue, without red, without variety. Without dislike for those who love him not. With the world's bounty he should be generous. My entire love is not a royal treasure-house. He shall be silent as to the things disclosed to him. Without the value of their love in all things. Without a loud, high voice. That you be smooth against everything rough. To every one that refused you. Without weakness, shall his countenance be. A hundred genuflections every evening. With a lesson at the end. After that the Miserere is sung. Is at the close and the beginning of day. Each one in his silence shall be silent. The brethren assume their habit. Coming to meet the King of Angels. And the chaste rule of the monks. That he await in his place, with strength. To serve your brethren in mere words. Such the rule I have observed. With peace in his actions. Let the bell for the refectory be heard. Let each one confess there his sins. A slice of honeycomb for the inferiors. To the Easter of the glorious Lord. It is given to each brother at None. So shall be the Order. Shall not go out of the enclosure. Whether ale, or cream, or new milk. That is meet for the seniors. Beware that he be not neglected. To go to another monastery. Where such people are found. Two-thirds of piety consist in silence. Until the end of October. All the good that they have seen. And had not heard anything. That the brothers be not over-burdened. Let none be idle in his house. Doing all things under the Abbot's rule. He shall maintain the rules. He shall relate in his monastery. Who covets not temporal things. Though it be not agreeable to thy body. Not engaged in secular pursuits. Will not lead to heaven. Leave not your enclosure 'till death. And a body growing slender. Your monks many in Heaven. Until your cell is occupied by another. Thou shalt bring them to Eoghan." The Irish Tract thus concludes this period of St. Brendan's Life: " The Saint, having written the Rule of the Angel, and the Rules of the Saints of Erin, with their devout practices and duties, returned to Bishop Erc, and received ordination at his hands." The Latin Life (cap. xi.) merely states that "after a short time the holy Senior Bishop Erc ordained him Priest." IV. St. Brendan founds some Monasteries. Extracts from Petrie's Letters on Corcaguiny. Letter of Burton. St. Brendan prepares for his First Voyage. Description of the Coracle. Examples from the Life of St. Columbkille, &c. Dichuil's Treatise. St. Enda of Aran. First Voyage of St. Brendan. The Islands of Kerry. Other Islands on the West Coast of Ireland. Some incidents of St. Brendan's Voyage. IT was probably in the year 503 that St. Brendan was promoted to the Priesthood, for it was prescribed by the Canons of our early Church, that only those should be admitted to the holy order of Priesthood who had attained their thirtieth year. Being ordained priest, adds his Life, he embraced the monastic life ; and many persons forsaking the world came to him from every side, and received at his hands the habit of religion. He, moreover, " founded cells and monasteries in his own district, but these were not so numerous at this period. It was when he returned from his sea voyage in search of the land of promise, that his rule extended far and wide throughout the various kingdoms of Erin." [Please consult the original volume for details of Petrie's Letters]. The description of the little boat, or coracle, in which St. Brendan set out on his holy expedition, as given in the curious tract entitled "Navigatio Sancti Brendani" gives us a glimpse of the nautical customs of our fathers. It was made, " as was usual in those parts," of wattled osiers, lined with thin boards of oak, and covered with hides which were tanned in oak-bark, and softened with butter. A rudder, a mast with a sail, six oars, and two additional sets of hides to provide against casual misfortune, completed the furniture of the tiny vessel. And yet it is nothing new in the lives of our Celtic saints to find these holy men braving the terrors of the deep in such fragile barks in search of a solitary life, or of a new field of labour for Christ. 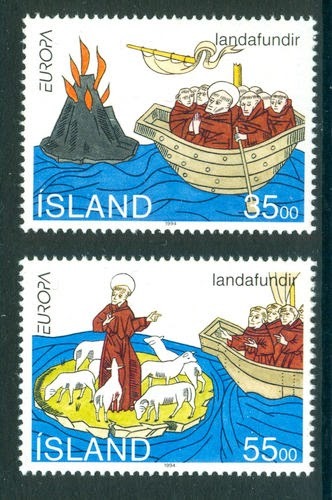 It was in such a boat that St. Columbkille set out to found his island monastery in lona ; and from this great centre of religion the disciples of that holy man quickly spread themselves, not only over the mainland of Scotland, but also to the desert islands off the coast ; even as far as the Orkneys and Shetland, and the Faroes. So fragile were these coracles that, Adamnan tells us, St. Berach and his religious crew well nigh found a watery grave between lona and Tiree, in consequence of the swell raised by a whale intent on pursuing its prey. Again, when St. Cormac, with his abbot's blessing, three times sailed forth to find a solitary place of prayer in the ocean, he each time failed in his purpose, owing to the storms which arose. In his last voyage he was driven towards the north by the wind for fourteen days, till he came where the sea was filled with a sort of jelly-fish, which clung to the oars, and beat against the sides of the boat in such numbers that Cormac and all his companions gave themselves up for lost. Adamnan, who records this fact, adds, that St. Columba, in Iona, had a vision of all that occurred, and summoning his monks together told them to pray for their brother monks who were far away in the midst of perturbations monstrous, horrific, such as had never been seen before. At their prayers a north wind sprung up which liberated Cormac from his tiny assailants, and brought him back safe to Iona to tempt the waves no more. The Anglo-Saxon Chronicle gives us another instance under the year 891 : " Three Scots," it says, " came this year from Ireland to King Alfred, in a boat without any oars, having left their country to be on pilgrimage for the love of God whithersoever Heaven might direct them. The boat in which they came was made of two hides and a half; and they took with them provisions for seven days. About the seventh day they came on shore in Cornwall, and thence journeyed on to King Alfred. Their names were, Dubhslane, Macbethadh, and Maelinnen." Early in the ninth century, the Irish monk, Dichuil, composed his remarkable treatise, " De Mensura orbis terrae." In the seventh chapter he gives an account of some of the most remarkable islands: "Around the coasts of our island, Hibernia, there are other islands, some of which are small, and others are very small (aliae parvae, atque aliae minimae). Near the island of Britain, there are many large islands, some small ones, some, too, of a middle size: some of them are in the Eastern ocean, some in the Western, but they are most numerous towards the north. In some of these islands I have myself resided, others I have visited; some I have only seen afar off, some I have read of." Subsequently, he again writes : " In the northern ocean of Britain there are a multitude of island(the Faroes) which from the north British islands may be reached, with favorable wind, and prosperous voyage, in two days and two nights. A certain religious, named Probus, narrated to me that in summer time sailing in a little boat with two sets of oars, he landed on one of those islands after two days and one night. Some of these islands are small, separated from each other by narrow straits, and for almost a hundred years solitaries from our Erin dwelt in them. But as from the beginning of the world they were uninhabited, so now, in consequence of the Northman incursions, the anchorites have fled from them, but they are full of large flocks of sheep, and of innumerable different species of sea birds. I have never seen these islands mentioned by any authors." In the life of St. Enda of Aran, we find another curious illustration of the wicker-work coracles which were used in those early times. This holy abbot, to test the sanctity of his religious, obliged each one of them to enter a coracle from which the skins had been removed, and thus put out to sea. If he was free from every fault he would escape unharmed by the waves, but if guilty of any transgression the coracle would not be sea-proof. Only one was found who did not escape a wetting in the coracle, and this was Gigniat, the cook of the community. St. Enda asked him what fault he had committed, and Gigniat acknowleged that when serving the repast of the brethren he had put a little to his own portion from the portion of Ciaran-mac-an-Tsaer, who subsequently founded the great monastery of Clonmacnoise. St. Enda at once obliged the cook to depart from the island, saying: " There is no room for a thief amongst us." This first voyage of St. Brendan, as the ancient document just referred to attests, extended only to the various islands which are scattered along the western coast of Ireland. Many of these islands were, even then, the abode of holy solitaries, and some of them still retain memorials and traditions connected with St. Brendan's voyage. One of the largest of these islands is Valentia, called in Irish Oilean-dairbhre, i.e., " island of the oak wood," and famed in profane history as the residence of the celebrated magician Mogh-ruth. It has still the ruins of an old church called Kill-more, i.e., "the great church," and two holy wells, one of which is called Tobereendowney, i.e., Tobar-righan Domnaigh, at which the patron is kept on 22nd March, and the other Tober Finan, i.e., "St. Finan's well," which is frequented on the 17th of May. The O'Gorman MS. (R.I.A., Dublin), written about the year 1750, whilst giving an account of some of the most remarkable places in Kerry, mentions several small islands lying along the coast. " There are many islands (it says), as Inishvernaird, Sherky, Rosmore, Ormond, and Dinish island ; besides the small islands of Dunkerron and Cappanacross, noted for quarries of marble and abundance of physical herbs and oysters. The most remarkable islands are the great Skeligs, formerly very much noted for pilgrimage over most part of Europe. The performing of said pilgrimage would be most impossible, had not Providence preserved and assisted those who undertook it. In said Skeligs is a well on the top of a hill that affords pure clear water, but is observed, as is said, to become dry in case of cursing, swearing, or blasphemy, &c. In said island there are two or three small stonework chapels, each as by appearance capable to stow no more at most than thirty persons, but by report would hold an hundred and more. . . . The other, called the small Skeligs, as well as Beginish, Scariv, and Dinish, are chiefly noted for the abundance of fowl and rabbits in them. Valentia, remarkable for the fort therein erected by Cromwell. The Durzies and Blaskets, chiefly noted as being landmarks generally taken by sailors coming from and going to sea, and other islands of less note." The name Skellig or Skerry is said by Dr. Todd to be 'of Scandinavian origin. It properly means an island-rock, or "Scopulus maris." The ancient tract "The Wars of the Danes," narrates how, in one of the incursions of the northern pirates, the barren rock on the coast of Kerry, called Scellig Michael, the abode of a holy solitary named Etgall or Edgall, was invaded by them, " and Etgal of the Skelly was carried off by them into captivity; it was by miracle he escaped death at their hands, but he afterwards died of hunger and thirst among them." The Annals of Ulster register this hermit's death in A.D. 823. "Eitgail of Skellig was carried away by the Gentiles, and he soon after died from hunger and thirst." Smith, in his "History of Kerry," gives some further particulars connected with these islands : " The first of the Skeligs, or that which stands next the shore, being within three miles of it, is called the Lemon, which is a round rock always above water, and consequently no way dangerous to ships. It hath little on it remarkable except its being stocked with several kinds of fowl, as in the second or middle Skelig, which stands about a league more to the west, and about six Irish miles from the shore. This rock is composed of a reddish kind of marble, and is frequented by an incredible number of gannets, and other kinds of birds. 'Tis remarkable that the gannet nestles nowhere else on the south coast of Ireland, and though multitudes of them are daily seen on all parts of our coasts, upon the wing and in the sea, yet they were never known to alight on any other land or rock hereabouts except on this island. . . . The great Skelig stands about nine Irish miles W.S.W. from Puffin Island. It is a most high and stupendous rock which was, until these few years past, visited by great numbers of people, ever since the time of St. Patrick, says Keating, by way of piety and devotion. The middle part of the island is flat and plain, consisting of about three acres of ground, that were formerly cultivated. This place is surrounded with high and inaccessible precipices, that hang dreadfully over the sea, which is generally rough, and roars hideously underneath. Upon the flat part of the island, which is about fifty yards perpendicular above the level of the sea, are several cells, said to have been chapels, for on this island stood anciently an Abbey of Canons Regular of St. Austin, said to have been founded by St. Finian. . . . The chapels or cells, with the wells of water, are dedicated to St. Michael the Archangel. Here are several stone crosses erected, at which the pilgrims perform certain stationary prayers, and have peculiar orisons to perform at each station. . . . The cells or small chapels are built, in the ancient Roman manner, of stone, closed and jointed without either mortar or cement, and are impervious to the air and wind, being circular stone arches at the top." Inishmore and Inishtusker, on the Kerry coast, are often spoken of in the lives of our early saints ; and Gough, when treating of Ventry harbour, which is in the barony of Corcaguiny, writes that " in several of the islands off this point are certain stone cells erected, according to tradition, by the first preachers of the Gospel in these parts : within resembling the most ancient Roman arches, and, like them, built without mortar. They were probably the first edifices of stone in Ireland, and coeval with the round towers. There is one at Fane, in Ventry parish, the most westerly land in Ireland, and another at Galerus, near Limerick." "Aran, thou sun! Oh ! Aran, thou sun, my heart is with thee in the west : to sleep beneath thy pure earth is the same as to be under the clay of Peter and Paul. Oh ! Aran, thou sun, my love lies in thee in the west : to be within the sound of thy bells is the same as to be in bliss." Giraldus Cambrensis, in his usual style of exaggeration, writes regarding Aran : " In the western part of Connaught there is an island called Aran, which they say was blessed by St. Brendan. There human bodies are never buried, and never rot, but lie exposed under the air, proof against corruption. There the wondering mortal can see and recognise his grandfather, and great grandfather, and his grandfather's grandfather, and the long line of his progenitors." Lynch, in "Cambrensis Eversus," thus criticises this statement : " Camden demolishes with a single stroke this fabric of fiction regarding Aran, and the Island of the Living : 'the isles of Aran, he says, 'fabulously styled the isles of the Living.' My own opinion is that Giraldus bungled his narrative by applying to Aran what is told of Inisgluair, an island off the coast of Erris, in the county of Mayo, for the bodies buried in that island do not decay, so that one could recognise his grandfather." It is said that St. Enda established ten religious communities on these islands, each one having its own superiors, and, independently of the rest, pursuing its routine of monastic exercises. St. Enda's own monastery was at Killeaney, to the east of the largest island. A book of the Gospels, and a chasuble, which was formerly covered with gold and silver, but in the fourteenth century only with brass, were preserved in the island with great care as relics of the saint. His life ends with the following narrative : St. Enda, when walking on the sea shore with some of his religious, a little before his death, was overwhelmed with sadness and burst into tears, because it was made known to him from heaven that the day would come when those islands would not be tenanted by monks, but with carnal and irreligious men. In a short time, however, he brightened up with joy when another vision was shown to him, that before the end of the world thousands would once more flock to these islands to escape the contagion of irreligion, and to walk in the paths of perfection. The island of Inisgluair, situated about a mile west of the village of Cross, in the barony of Erris, was also visited by St. Brendan, and still honours him as patron. This island is famed in popular tradition as being, through his blessing, "the land of the living;" and O'Donovan tells us that the tradition that no bodies interred there were subject to decay, is still vividly remembered by the inhabitants of Erris and Inis-Seidhe. The island is now uninhabited, but retains the ruins of a church and other traces of ancient religious civilization. Ardillaun, or "High-island," also lies at a short distance from the western coast of Connaught. The ruins of its beehive houses, cloghauns, churches, and enclosures, prove it to have been at a very early period inhabited by an ecclesiastical colony. O'Flaherty, in his account of lar-Connaught, describes it as "anciently called Innishiarther, i.e., the West-island, inaccessible except in calm, settled weather, and so steep that it is hard, after landing in it, to climb to the top !" He mentions an abbey founded there by St. Fechin, of Omay, and gives the names of eleven holy hermits, famed for sanctity, interred within its precincts. Towards the centre of the island is a holy well, and near it is still preserved a sculptured cross, in the earliest style of Celtic Christian art. The remains of many other rudely engraven crosses are scattered through the island. Two of these are represented in the plates of the tenth volume of the Proceedings of R.I.A. (1870), and with them may be seen two other crosses of the little island called Illaun McDara, which is also situated on the west coast of Galway. I will only mention one other of the many islands on our western coast celebrated in the early records of our saints. This is the island of Innishark, which, though situated off the coast of Galway, belongs to the county Mayo. St. Leo is honoured as its patron, and among the monuments which it retains connected with his name are a ruined church, a leabuidh, i.e., a penitential bed, a tubber-banagh, or holy well, a stone cross called leac Leo, and a clochan, or stone-built cell : " of the church, which seems to have been of the usual rectangular shape, there remain parts of the north and south walls, with the east gable. In the latter there are the remnants of what must have been a rather handsome single lancet-shaped window. The clochan is situated (within an enclosure, 60 feet in length, and 45 in breadth) at some distance to the southward of the church, on a cliff overlooking the sea. It appears to have been an extremely primitive structure, built without any regard to regularity of form. . . . The outside of the clochan appears to have been of a bee-hive shape ; however, it is now much dilapidated, more than half of its roof and front being destroyed. The stone cross is much broken and disfigured. In the time of O'Flahertie, the historian, there was a bell belonging to St. Leo on Innishark, but Hardiman, in his notes, written in 1846, mentions that it has long disappeared." It was during his first voyage that St. Brendan was favoured with a vision of the torments of the damned, the details of which are described in the Irish life of our saint, with all the vividness of Celtic poetry: " The door of hell (it thus begins) was revealed to Brendan, and he saw within the rough blue prison, full of stench, full of flame, full of nastiness; full of the camps of poisonous demons: full of crying, and of wailing, and of wounds: wretched shouts and great voices of lamentation and moans, and beating of hands of the sinful tribes: a life heavy, sorrowful in the hearts of pain, in prisons of fire, in streams of unceasing flames: in rocks of continual woe ; in black gloomy puddles, in chairs of heavy flame, in an abundance of woe, and death, and crosses, and chains; in oppressive fights and terrible shrieking of demons: an abode of eternal cold, eternal night, eternal sorrow, eternal pain, eternal avenging flames from the depths of the abyss." One of St. Brendan's companions expressed a desire to have a vision of this place of dreadful torments : "Obtain the favor for me," he said, " that I may see some of these pains." And St. Brendan having prayed for him, he almost immediately expired, crying out : " Woe, woe, woe, to those who have come, who shall come, and who at this moment come into this abode of torments ;" but St. Brendan again prayed to God in his behalf, and ceased not to pray till the dead man was quickened into life, and resumed his duties among the brethren. The legend of the mermaid is next told. They met her dead body on the waves, and Brendan having restored her to life, asked her who she was, and whence she came. She replied : "I am one of the inhabitants of the sea : we pray and await the Resurrection." Brendan then baptized her and asked her what was her wish : did she desire to go to heaven or to return to her company of the deep. She replied, but none except Brendan could understand her words : "I desire to go to heaven, for I hear the voices of the angels praising the all-powerful Lord." And then this daughter of the sea peaceably closed her eyes in death. The account of one island which they visited agrees perfectly with the description of Ardillaun given above." On a certain day they saw a beautiful island rising high above the waves. They rowed towards it, but could not find an easy harbour. For twelve days they sailed around it, but were not able to enter it during all that time. They heard, however, the voices of people praising the Lord, and they saw a lofty noble church within the island. As they were unwilling to depart from the island, a waxed tablet was let down to them from the rocks, and on it were inscribed the words:' Do not seek to enter this island : this is not the island granted to you by God : return to your country: multitudes there await you, and hold in mind the words of holy scripture : Mansiones Domini multae sunt'. Then sailing away from that island, they bore with them the waxed tablet as a memorial of its people, and each day they read it with joy, as if it had been divinely sent to them." Another day, whilst rowing on the sea, they were seized with intense thirst, so that they were nigh unto death. They then saw, at a distance, a small island with clear, pure streams gushing forth from its rocks. The brethren asked : " May we drink of this water ?" But Brendan replied : "Let it first be blessed." And when they had given their blessing to it, and chaunted the Allelujas over it, the stream flowed back, and they saw the demon seated on the rocks awaiting to kill those who would drink of its waters. Thus they were saved by the prayers of Brendan; their thirst, too, ceased immediately, and by their blessing that island was thenceforth closed to Satan, and its waters were harmless to man and every other living being. Notes on the Life of St Brendan, Irish Ecclesiastical Record, Vol.VIII (1872), 17, 79, 178, 193.